NOTE: Skimmer Filter Mats - Should be replaced every 2-3 years or when they can no longer be rinsed clean. Some of our customers like to start each year with new pads. They can be rinsed clean when ever needed through out the year. Skimmer Brush Sets - Should be changed only when they start to fall apart or rust. They can be rinsed clean when ever needed through out the year. From Glenda Franz of Des Moines, Iowa on 6/9/2013 . From Masaaki Shimizu of Westport, Connecticut on 3/28/2013 . From Vince of Miami, Florida on 10/30/2012 . From Anonymous of Shelton, Connecticut on 4/23/2012 . 9/23/2014 – Can I replace a 14 1/2 by 18 1/2 filter mat with brushes and what should I buy if this is possible? Thanks, Leslie. 3/6/2013 – What is the thickness of the Aquascape Classic Mini Biofalls (29073) and Standard Skimmer (29082) filter mats? 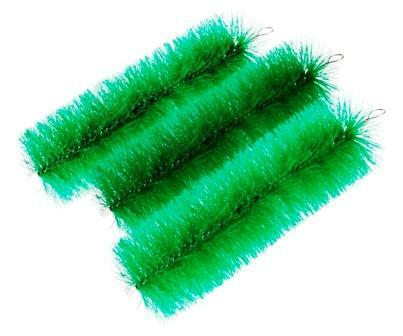 6/17/2011 – I need 5 replacement green skimmer brushes 16" length, 4" diameter with wire that can be screwed into plastic holder rings. . . .